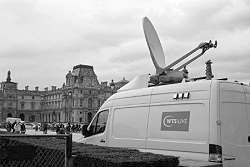 Paris: WTS Live to supply SNG broadcast services for EURO 2016. Airport City, Israel, March 2016: RR Media, a leading provider of global digital media services to the broadcast and media industries, has announced that it has teamed up with France’s premier broadcast facilities provider, WTS Live to offer broadcasters, news organizations, content owners and sports rights agencies a full suite of digital media services at UEFA Euro 2016 - Europe’s premier football competition for national teams. Camera operators, Production Managers and technical teams will be on the ground during the tournament, providing 24/7 support and service in the 10 host cities and stadiums around France. RR Media and WTS Live have combined their resources to offer complete media packages, including live stand-up/ recorded transmission, turnaround, production and content delivery to operators worldwide, over multiple platforms, in different configurations. Additional services include a stunning terrace position with ‘the best view of the Eiffel tower’ in Paris accommodating single camera stand-ups and outdoor studio presentations. This together with the capability to provide SNGs, camera crews, filming on the Seine and around the sights of Paris, providing outside studios and filming for special events in all the participating stadiums, offers additional content to insert into a program’s lineup or as part of a highlights package.